I love pasta. Any pasta. But sometimes you want to get past the tomato sauce and pesto and do something different. 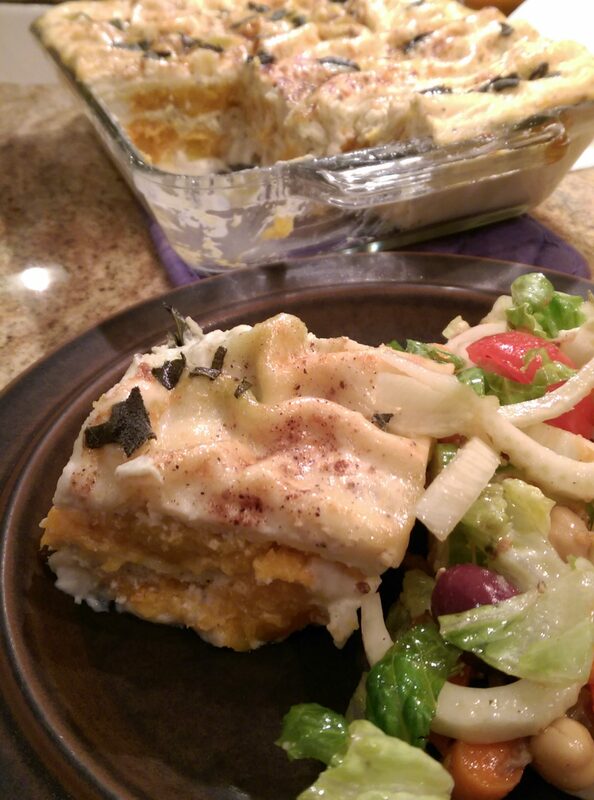 So inspired by all of the beautiful and colorful squash that is readily available now, I came up with a lasagna filled with butternut squash, ricotta and fontina cheeses and bathed in a béchamel sauce flavored with nutmeg and sage. It may not be traditional, but it is delicious. It requires nothing more than a green salad and some good bread. Place the diced butternut squash in a large pot and cover with about 2 inches of water. Bring to a boil. Then turn the heat down to a simmer and cook for 12 minutes or until squash is tender. I always test it by taking a sharp knife and if it easily pierces the squash and it slips off the knife then it’s done. Drain the squash. With a fork or potato masher, mash the squash, leaving some cubes and texture. Add one teaspoon of salt and some fresh cracked black pepper to taste (about 5 cracks). Do not puree. Set the squash aside. In a medium bowl, mix the ricotta with the eggs, about 1/2 cup of the grated fontina, a scant teaspoon of salt, 1/4 teaspoon of ground nutmeg and 1/4 teaspoon rubbed sage. Set the mixture aside. You are now ready for the assemby. Using a lasagna pan (about 13 x 9 x 3) ladle in about 1 cup of the béchamel sauce to cover the bottom of the pan. Then take 3 sheets of the lasagna and following the directions on the box, place one piece across the narrow end and lay two piece side by side facing the other direction. Don’t worry if there is a bit of space between. It will be fine when it cooks. Ladle enough of the sauce to cover the pasta sheets lightly. Add grated cheese to cover in a thin layer. Carefully lay on about 1.5 cups cups of the squash mixture, gently spreading it to cover. Now layer on about 1/3 of the ricotta mixture, gently spreading it over the top. Add another layer of pasta, this time alternating the end which has the single piece of pasta. Repeat Steps 8 and 9. Do this one more time. The final layer is just pasta, sauce and cheese. Sprinkle over some nutmeg and sage (Use a light hand with this.) Cover with foil and place in the oven for 30 minutes. After 30 minutes, uncover the lasagna and bake for another 15 minutes. If the lasagna isn’t a nice golden brown, turn on the broiler. Watch the lasagna since it can brown all of a sudden. Allow the lasagna to “rest” for 15 minutes before serving. This can be made ahead and covered with foil until you are ready to serve it. Gently reheat the lasagna in a 325 degree oven for 10-15 minutes. NOTE: While I haven’t done this, there is no reason that this shouldn’t freeze well.